The matter will come up for hearing on September 17. 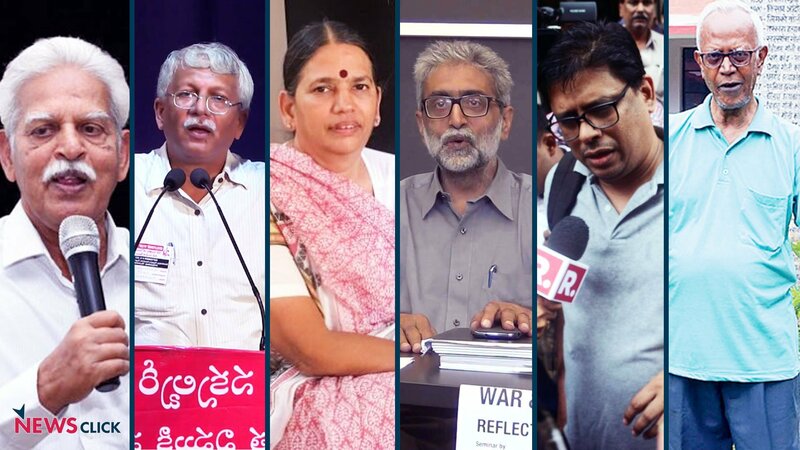 Five activists who have been arrested by the Pune police in connection with the Bhima-Koregaon violence will continue to remain under house arrest till September 17. The Supreme Court on September 12 deferred the hearing on a public interest litigation (PIL) filed by historian Romila Thapar and four others, after it was submitted that senior advocate Abhishek Manu Singhvi - who is representing the petitioners - was busy in another court. The apex court bench comprising Chief Justice Dipak Misra, Justice D.Y. Chandrachud and Justice A.M. Khanwilkar clarified that the interim order placing the five accused under house arrest shall continue until the next hearing. Notably, after the locus standi of the petitioners were challenged by Additional Solicitor General (ASG) Tushar Mehta – who is representing the Government of Maharashtra – during last week’s hearing, the top court was apprised that four out of the five accused – Advocate Sudha Bharadwaj, Vernon Gonsalves, Varavara Rao and Arun Ferreira – have filed a supplementary affidavit seeking impleadment to the proceedings before the top court. In case of noted rights activist Gautam Navalakha, whose transit remand from Delhi to Pune was earlier stayed by the Delhi High Court, Mehta objected to taking recourse to two remedies, before the High Court and again the Supreme Court. Justice Chandrachud noted that Navalakha is not a party before the apex court. Appearing on behalf of advocate Surendra Gadling- who was arrested on June 6 along with Shoma Sen, Sudhir Dhawale, Mahesh Raut and Rona Wilson- senior counsel Anand Grover told the court that his client has been sent behind bars because he defended Delhi University Professor G.N. Saibaba in a court of law. “He has an experience of 25 years as an advocate, but he is being treated like a third-grade criminal,” argued Grover. “No, you don’t,” argued Grover, telling him that “he (Gadling) is being treated like a criminal just because he appeared for Saibaba”. “The lawyer is in the hospital and wants to argue his case but is not being allowed,” he told the court. He drew the court’s attention to an additional document. “ ‘You will be the next’… it is the honourable chief minister’s speech and we have put it on affidavit that the advocate was threatened,” Grover said. Gadling’s wife Minal Gadling moved the Supreme Court on August 31 seeking to intervene in the petition filed by Romila Thapar and others. In her petition, she has claimed that all the arrested five, including her husband, have been in a false and mala fide way implicated in the case even when there was no involvement on their part in any such activity. “It is stated that all the five persons hold significant position in the society and have dedicated their lives for fighting social injustices. They are being targeted in this case for being voices of dissent, and for taking up battles against forces perpetrating injustice," the plea said. Minal Gadling alleged that her husband was harassed inside the jail and as a result he had to be admitted to a hospital. She claimed the medical reports were not handed over to her. Prominent Telugu poet Varavara Rao, activists Vernon Gonzalves, Arun Farreira, trade union activist and lawyer Sudha Bhardwaj and civil liberties activist Gautam Navalakha were arrested by Pune police from their respective homes on August 28 in connection with an FIR lodged there following an event – ‘Elgaar Parishad’ (conclave) – held on December 31 last year that had triggered violence at Bhima-Koregaon village. The ‘Elgaar Parishad’ was organised by two former judges and Dhawale, a Dalit activist and editor of a Marathi magazine Vidrohi at the historic Shaniwarwada near Pune to commemorate 200 years of the Bhima-Koregaon battle.